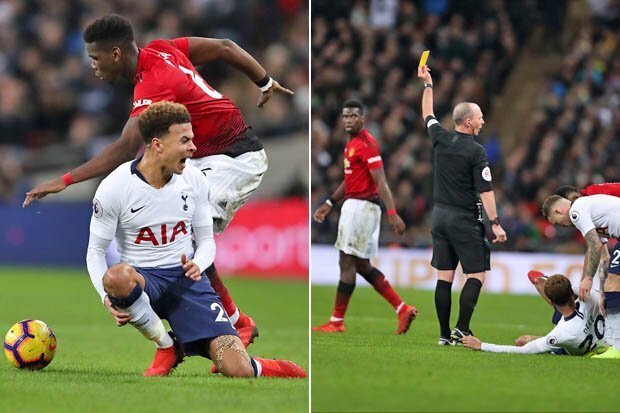 Liverpool legend Graeme Souness says Paul Pogba should've been sent off during Manchester United's 1-0 win at Tottenham on Sunday night. The France international set up Marcus Rashford for the winning goal in the first half. But there are claims he should have been sent off for a late challenge on Dele Alli. Pogba's left boot made contact with Alli's knee as the ball came across the pair. I think it's a red card. Sorry Jamie (Redknapp), I disagree with you. It's a red card. Not one ounce of doubt in my mind. Not one ounce. He knows what he's done. Let's start with what Jamie's saying. You step over it and use your strength to keep the player away. But look where the ball is and look where the foot it. When you're doing that your studs are generally always aiming towards the ground.